The 'difficult second season' is a phrase Ebbsfleet United's Tom Phipp can probably associate with, following a testing campaign in Blue Square Bet Premier. Thrust into the world of senior football two summers ago, the midfielder emerged as a star of the Fleet's promotion-winning side, scoring big goals and thriving on his new responsibilities at Stonebridge Road. Life one step up was never going to be easy for the north Kent club, however, nor for Phipp, a former Arsenal trainee. His season started in the worst possible fashion, shown a straight red card for a dangerous tackle against York on the opening weekend. 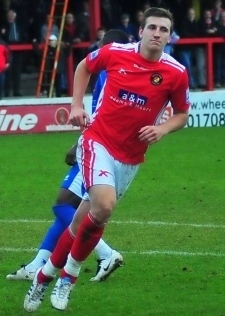 After suspension, Phipp returned to make 40 appearances as the Fleet dropped anchor in the calm waters of lower mid-table, without ever producing the fireworks which lent him the headlines in 2010/11. As the club continues to find its feet back among the non-league elite, though, expect Phipp to return hungrier and better after the summer. At the end of April you tweeted that you were going under the knife... What was the operation, how did it go and how are you doing now? I had my nose reset back to normal after breaking it God knows how many times ha. It went well and I'm recovering really well from it. If footballers were given an end-of-season report, what would yours say? It would probably just say: "Didn't reach peak and thank God it's over so you can stop moaning now." From a personal point of view, has this season (survival/consolidation) been as satisfying as last (promotion)? Yeah it has been very satisfying, being able to compete at this level and get results to get safety comfortably. But obviously last season was great in regards to the success we had throughout the whole season!! What was your first pair of boots? Who were your footballing heroes growing up? Becks has to be one and I loved watching Dennis Bergkamp and Thierry Henry as an Arsenal fan. John Terry's going to the Euros while Rio Ferdinand misses out. Has Roy Hodgson got that one right or wrong? Rio should have gone. He's a top defender and both him and Terry get paid enough and are mature enough to put differences aside for their country. You've played in a north Kent derby, so are you pleased to have Dartford back on the fixture list for next season? I'm looking forward to it. Should bring in big gates, which is what us as players want to play in front of!! Your twitter biog says "run the distance necessary whilst chasing a dream." Why is that mantra important to you? It's a tattoo I have on my back and it just means never stop chasing a dream you keep dreaming!! What's the best goal you've scored? From a player's perspective, what does it mean to see Liam Daish sign up for another two years at Ebbsfleet? It's great to see, as he has done well at the club. Although it means we still have to put up with his tantrums as he does with ours. A few team-mate questions: who's the most skilful, who's the best trainer, who's the worst dancer and who's the biggest moaner? Skilful... Paul Lorraine. Best trainer... Calum Willock. Worst dancer... Ricky Shakes. Biggest moaner... Joe Howe. Do I detect a dash of sarcasm here? I'm a medium man, very safe!! I am the worst for hot food ha!! The Four-ball... Westy [Michael West], Stoney [Craig Stone] and Joe Howe. I'm a young one, so... Played with... Jack Wilshere, Jonjo Shelvey, Henri Lansbury!! Played against... Jack Rodwell, Emmanuel Frimpong. What did you learn from this season? I learnt a lot about how competitive the league is and about myself and what I need to do from myself in order to compete properly next season. Ebbsfleet United for the last couple of seasons has been more like a family than a football club. That's not just the boys, but throughout.